Nilgun Bayraktar is an assistant professor of film history, theory & criticism in the Visual Studies Program at California College of the Arts . Her work focuses on migrant and diasporic cinema in Europe, experimental and avant-garde cinema, screen-art, site-specific art, and performance. She received a B.A. in Cultural Studies from Sabanci University, Istanbul, and a Ph.D. in Performance Studies with a designated emphasis in Film & Media Studies from the University of California, Berkeley. Nilgun Bayraktar is an assistant professor of film history, theory & criticism in the Visual Studies Program and Film Program at California College of the Arts. Her work focuses on migrant and diasporic cinema in Europe, transnational cinema, experimental and avant-garde cinema, projected image art, site-specific art, and performance. She received a B.A. in Cultural Studies from Sabanci University, Istanbul, and a Ph.D. in Performance Studies with a designated emphasis in Film & Media Studies from the University of California, Berkeley. Her academic publications include articles in journals such as New Cinemas Journal of Contemporary Film and Turkish Studies Association Bulletin as well as chapters in edited collections such as Orienting Istanbul: Cultural Capital of Europe? and Turkish German Cinema in the New Millennium. 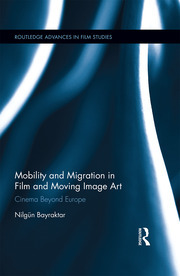 Her book, Mobility and Migration in Film and Moving Image Art: Cinema Beyond Europe (Routledge 2016), examines cinematic and artistic representations of migration and mobility in Europe since the 1990s. Bayraktar’s most recent research project explores the ways the genre of dystopian science fiction is employed in visual arts, cinema, and performance to investigate shifting definitions of “human” and its boundary with the machine. Before coming to CCA, she was a postdoctoral lecturer in the Humanities Program at Boğaziçi University (2012-2015), where she co-designed and co-taught core courses on literary, philosophical, and cinematic works from Ancient Greece to modernity. She has also been a James R. Gray Postdoctoral Lecturer at UC Berkeley (2011- 2012), where she taught courses on world cinema and auteur theory. At CCA, Bayraktar teaches courses such as “Introduction to the Arts,” "The City and the Moving Image," "Mobility and Migration in Cinema," "Film Practices and Genres," and "Graduate Film History."